The groom's attire was a no brainer for us and isn't exactly rockabilly, but may give a few of you reenactor types ideas. My fiancee is really into Indiana Jones and has quite a bit of his clothing already so he decided to dress like Indy in the beginning of Temple of Doom. 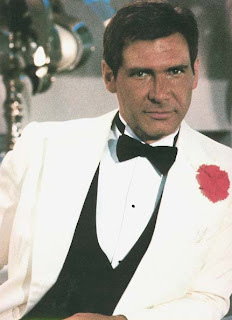 All he needed was the white tux jacket which we found on e-bay for $40, including shipping. It was a little bit hard to find because it has a peak lapel, as opposed to the more common shawl lapel. There is also an ongoing argument as to whether or not his lapels are satin or matte. After viewing a bunch of pictures and watching the movie, we came to the conclusion that they are slightly shiny, however the jacket we found has matte lapels but for the price we weren't going to complain. For the groomsmen we had originally thought about bowling shirts and dark pants or jeans. We quickly decided to change to cuban cigar shirts or guayaberas in different colors and black dress pants because it would be a bit more dressy and match my fiancee's tux more. Instead of flower corsages the guys will have either a white or red handkerchief, depending on which color better matches the color of their shirt. We found all 5 shirts on ebay and were able to get them for less than $18 each. There is one shop in particular (Goodfellas Wear) that has them arranged by size, which makes is SO much easier to shop. The guayaberas in this shop are basic one color shirts, which can really work if you want the same color for all. If you want fancier ones (like the one pictured) you'll need to search ebay a little bit more. As far as shoes, we are getting married right on the lanes in the bowling alley and we need to put something down so we don't wreck the finish of the lanes. To save some money and headaches we are having our bridal party wear bowling shoes during the ceremony. I, my fiancee, and our officiant will wear regular shoes and we'll probably get carpet runners to put down in a T formation. There is a pretty decent online series of articles about planning a vintage wedding on the Greeting from Port Halcyon blog. In keeping with my last post, you can jump straight to the article on vintage bridal gowns here. [note: I am linking to an archived copy of the page as the site is no longer active]. Keep in mind that this series is somewhat dated having been written in 2004 and some of the things that are referred to are no longer available or in print; most notably Daniela Turudich's A Vintage Wedding. My suggestion for out-of-print books would be to check Worldcat.org to see if a library close to you has it. 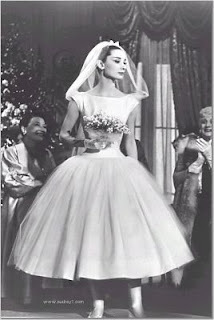 I have always been in love with Audrey Hepburn's wedding dress in Funny Face. I knew I couldn't afford a modern reproduction of it and the chances of me finding a vintage dress in my size is nil- I am a curvy girl that hasn't been a size 6 since middle school. I am lucky enough to be a seamstress so I decided to make my dress. I am also lucky enough to have an aunt who went to fashion school and owned her own bridal shop in LA before she moved back to WI and I quickly drafted her help. 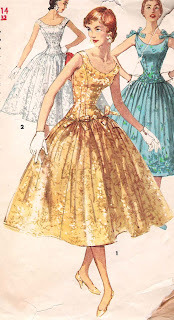 The first thing I did was to get online and find pictures of dresses and patterns from the 50s that I liked for inspiration, besides Audrey's dress that is. My original idea was to buy the material and resize a vintage pattern to make the dress from scratch. As I was searching, I found a vintage prom dress on e-bay that I fell in L-O-V-E with (on the right). It wasn't even close to my size, but the skirt could have been detached from the bodice and either reattached to a new one in my size or kept as a skirt and I would make a shirt to go with it. I could then reattach after the wedding so the dress could live on it it's original form. Alas and alack, I lost the bid by $10. After much gnashing of teeth, I realized that although I didn't win my dream dress, I could possibly use other vintage dresses to refashion my dress and save a ton of money on materials, as well as be green. I found three gorgeous dresses (all beautifully beaded) at a thrift store in Wheeling, IL (my fiancee's hometown) called Little Mexico. For less than $100 I got the dresses, as well as some other wedding items like a veil and ring pillow. SCORE!!! The full beading also meant we would be keeping the sleeveless cut of the gown and creating a faux sweetheart neckline by pinching the front of the scoop neckline with a gather. 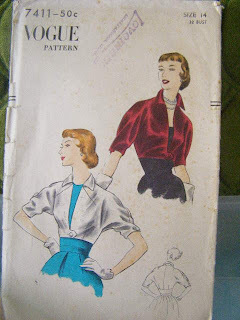 Because the dress will be sleeveless I decided to also make a bolero jacket in a 50s style. Back on e-bay I found a pattern I liked which cost $7 with shipping. It will have to be resized, but I love the high neck. I will be using leftover material from the thrift store dresses to make it, probably part of the skirt of the "bodice dress." Sorry I have no pictures of the thrift store dresses to give you a better idea of what I mean as I explain everything, but I am trying to keep any visuals of the materials a secret from my fiancee. I will be posting a ton of of pics after the wedding, I promise. The construction of the dress will start once I have my wedding corset in hand. Once again I am repurposing and using my mother's wedding dress for the outer layer of the corset. I didn't want the stress of making it myself, especially because I have never made a corset with a busk front, so I am having a custom corset made by the super talented Rohm on etsy. I was pleasantly surprised to find that she lives within driving distance of me and went to college with a close friend of mine who highly recommended her work. I could tell from meeting with her that she had skillz and I can't wait to get my corset from her! Another integral part of my dress is the crinoline. I decided to go with a traditional white dress, but my netherpinnings will be lipstick red. 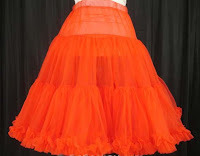 I ordered a 22"long soft chiffon crinoline with matching pettipants from Glamour Boutique online. Both items together cost $61 (free shipping). The only drawback of ordering from this site is that it takes 14-18 weeks to get the crinolines from the manufacturer due to the custom sizing available. Order with PLENTY of time. Luckily I have other crinolines to use for hemming my dress until the real one comes. My fiancee and I decided to design and print our own save the date cards and invitations. However, I had recently taken advantage of Vistaprint.com to print up business cards and got an email with some other deals they were running, which included 100 free postcards- we pay for shipping. With shipping as low as $7ish, there was NO way we could print cheaper than that, plus we could basically design our own cards through them anyway by either starting with one of their designs and editing it or creating our own from scratch. This particular time they were also allowing free uploads (they usually charge a small fee for them). They have tons of designs to choose from if you wanted to go a bit more traditional. Also, you can print anything you want on the back side to save money on return address stamps or a whole lotta writer's cramp. Non-color printing on the back and a glossy finish on the front are included for free, if you want. We just got our cards in the mail and I can't be happier. We also got 140 return labels through an extra deal they offered in the checkout that we can use for our invitations. The entire order of save the date cards, return labels and shipping was $12. -Create an account before you buy anything to get emails from them. They send super-duper deals this way that you can't find by just going to their website. -Even though their slowest shipping says it can take 21 days to get to you, it has never taken that long for me. Unless you absolutely have to get it sooner, choose that option to save on shipping. We are still planning on doing our own invitations because we managed to find a DIY blank kit of 100 invites for $10 at Wal-mart right after the holidays. Even with a $38 printing cartridge, it will still be more cost effective than going through someone else. If you are planning a rockabilly or 1950s themed wedding, you probably already have a good idea of what you want to wear or look like. However, you may be someone who is in the wedding party or invited to one of these weddings and have no clue where to start. Or perhaps you just want more info on the style. This post is for you. Brides, I will be dedicating an entire post to wedding dresses soon. There really are no hard and fast rules about rockabilly fashion, which can be liberating and frustrating at the same time. Usually the look is based on fashion from the 1950s and moves its way outward. Some people like the nostalgic 50s look with sweaters, pencil skirts and crinolines. Others go for a harder edge and prefer jeans, leather and tattoos. Or maybe you mix the two. The big thing is to accessorize! If you wear glasses, get online and find a pair of vintage cat-eyes or raybans; if the glasses aren't too petite or fragile you can usually have your prescription put into them. Guys, get a chain wallet or letter sweater. Gals, hair flowers are a must- in every color. The purpose of this post is mainly to point you to the Rockabilly Fashion links section (to the right) where I will be continually updating sites that I feel give you a good example of what is out there. I also started a flickr set for my wedding guests to give them an idea of what they could wear if they wanted to indulge in our theme. If you have some pictures you think should be included in my set, please let me know. I get this question a lot, especially when I tell people I sing in a rockabilly band (Sidecar Steph & the 7-10 Split). Rockabilly can be so many things to so many people, so I'll keep my definition to what I think it is and perhaps others will add on through their comments. I could wax poetically for hours on end on this subject, but I'll save that for my masters thesis and keep this post as simple as I can. Rockabilly as a word is "rock+hillbilly" and many of the early musicians were considered country & western, like Rose Maddox & the Maddox Brothers and Charline Arthur. There were also quite a few jazz musicians that would contract in to a studio session, like Les Paul, and Sun Records was crawling with players from both genres. Sun Records is considered by most to be the birthplace of rockabilly music and they owe much of that to Elvis Presley. Here's where it gets interesting- Elvis was heavily influenced by African American music, specifically gospel and R&B bop, and this, coupled with the aforementioned genres, provided the driving beat that really gave rockabilly it's unique sound. So now we have three diverse influences helping to create this new and exciting sound. When people think rockabilly they usually remember the men of the genre, like Elvis, Johnny Cash, Jerry Lee Lewis, Buddy Holly, etc. 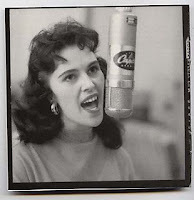 However, there was a huge female contingency that could rock just as hard as the men- Wanda Jackson (pic on right), Janis Martin, LaVern Baker and Barbara Pittman are just a few. Rockabilly music unfortunately went as quickly as it came, mostly because of social issues and a fear of "the beat, the beat, the beat." Luckily, interest was revised in a big way in the 1980s by groups like The Stray Cats and The Blasters. Psychobilly (punk+rockabilly) also came out of this movement led by the group The Cramps. The genre just continues to grow and thrive, with it creating an attractive lifestyle that goes beyond the music. What in tarnation is rockabilly? I will get into this more in my next post, but think early Elvis and Johnny Cash, Jerry Lee Lewis, Wanda Jackson and Stray Cats. Its not just poodle skirts and leather jackets or pompadours and tattoos. There are a million things one can do at a rockabilly wedding and not a lot of help available. Did I also mention I am a full-time grad student and we are broker than broke? No planner for us, this was strictly DIY, from the ceremony to the honeymoon. I have six months left and have managed to keep my costs realistic and pretty darn low. If things go as planned, the whole wedding will cost less than $3,000. Would you like to learn how I did it? I thought someone might, so I have created this blog to help anyone else who needs to plan a small budget wedding, particularly one with a rockabilly theme. Keep in mind that our wedding is far from traditional, but it sure will be fun!